Free Shipping Included! 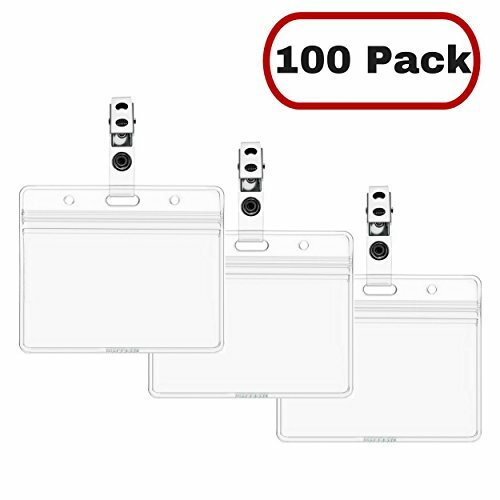 MIFFLIN Clear Plastic Horizontal Nametag Badge Holders and Metal Badge Clips with Vinyl Strap (100 Pack, Horizontal 2.25x3.5) by MIFFLIN at Community Frontiers. MPN: CLPHOR100CLR. Hurry! Limited time offer. Offer valid only while supplies last. BE FAST AND ORGANIZED Makes organizing your conference, workshop, reunion, meeting, or any kind of social or business event a little bit easier. Makes organizing your conference, workshop, reunion, meeting, or any kind of social or business event a little bit easier. The Mifflin badge holder with clips sets let you avoid the frustration of buying unmatched holders and clips from different sellers or with unmatched quantities. Create your own combination of our multipacks in a single order to get the quantity that best suits your need. ID holder pouch is made of flexible, clear, tear resistant vinyl. And it's waterproof! The re-sealable holder keeps your tags, credit card, RFID badge, or hotel keys safe and dry. We offer you package deals on various quantity levels in prices you won't find elsewhere. Buy the quantity of tag holders and clips you need without overspending. CHECK OUT ALL THE MIFFLIN PRODUCTS! DIMENSIONS: holder is 2.4 x 3.75 inches, fits 2.25 x 3.5 nametag insert; metal 1"x0.375"; strap 2.75"x0.5"
If you have any questions about this product by MIFFLIN, contact us by completing and submitting the form below. If you are looking for a specif part number, please include it with your message.